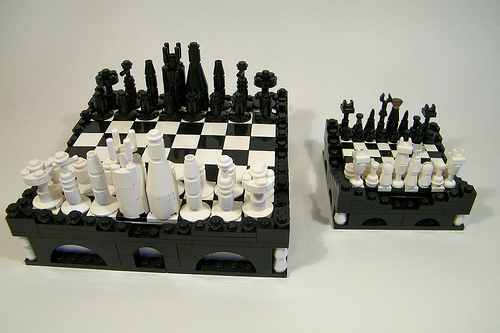 These are two sets that I made for Classic Castle’s Chess Challenge, which ends tonight. I had a lot of fun with these. I’ve never made two matching creations in different scales before. Do people really play these? Or just for looks? Also all of these chess sets need a chess tag. ^ We’re fairly sparing with the new tags we add to the navigation. It is, after all, pretty easy to search for the word “chess”. Really cool sets, Josh. Looking forward to seeing them in person tomorrow.